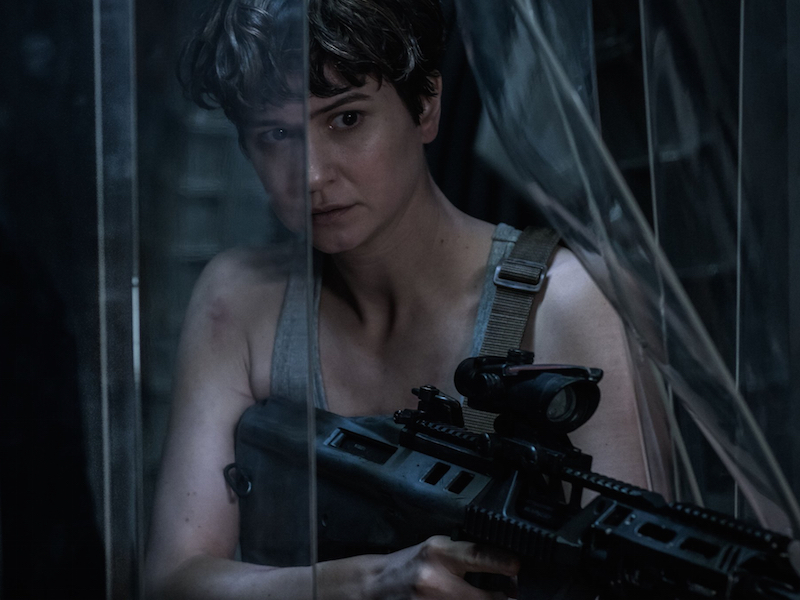 Alien: Covenant is a piece of franchise filmmaking that floats aimlessly in the cold and vast darkness of space, desperately seeking a reason for its own existence. Wedged chronologically between the ponderous Prometheus and the still unimpeachable Alien, it has neither the ambition of the former nor the genuine terror of the latter and further muddies the waters for those diehard fans who may still be thirsty for answers to questions that likely didn’t need to be asked in the first place. Like another recent flop Life, itself a ripoff of the Alien films, it features supposedly smart scientists making dumb decisions that lead them to square off against a creature that’s more frustratingly familiar than fearsome. Taking place ten years after the events of Prometheus, Covenant follows the crew of the titular spaceship as they head towards a habitable planet with a plan for colonization but when they cross paths with a seemingly more suitable planet, their captain Oram (Billy Crudup) decides it’s worth an investigation. While on the initial expedition, two crew members come in contact with alien spores that cause a gruesome demise for those infected and imminent danger for the remaining crew by way of newly spawned skittering creatures. After being saved by a mysterious inhabitant (Michael Fassbender), he fills the Covenant group in on the secrets that exist within the ominous new world that they’ve chosen to uncover. This is Ridley Scott’s third time in the Alien universe and I’d like to believe that he’s returning to these projects for passion above paycheck but there are indications here that he’s more interested in reveling in the glory of his previous successes rather than adding something meaningful to its mythology. He also falls into the increasingly common problem with prequels which involves unnecessarily demystifying aspects of the original work to the degree that their novelty becomes diminished in hindsight. There’s really no need to explain away every facet of how these alien creatures came to be or how they function and deconstructing the nature of their existence makes them less “alien” than they were intended to be in the first place. Even though Prometheus was also guilty of these sins, at least it was committed to its inquisitiveness with a keen sense of wonder and a human sense of trepidation when exploring the universal questions that have kept mankind at bay for centuries. Aside from an excellent prologue that reunites Fassbender with Prometheus co-star Guy Pearce, Covenant forgoes any existential musing in favor of painfully conventional slasher-inspired horror sequences replete with gratuitous bloodshed and often unconvincing CGI. It’s also difficult to root for a group of seemingly intelligent people who make bafflingly bad choices; I’m no scientist but even I can tell you that setting foot on an uncharted planet without a space suit is probably a poor idea. Before my screening, my theater played a promising trailer for the upcoming Blade Runner 2049, a belated sequel to another Ridley Scott masterpiece that could be counted among my most anticipated movies of the year. Besides a talented cast and a technical team that includes Johann Johannsson and Roger Deakins, the film is being helmed by visionary director Denis Velleneuve, who is looking to capitalize on the success of last year’s breakout hit Arrival. Perhaps it’s time to let another creative voice have control over the Alien franchise as well because if Alien: Covenant is any indication, Scott may have finally run out of story to tell in this sci-fi saga.